Babcock Cemetery is located on Babcock Road, approximately one mile north of the main road and is on the right side of the roadway next to a farmhouse. Spaces throughout the cemetery indicate possible other burials, but no evidence of gravestones presently exist. Cemetery listing compiled by Gordon D. Clark of Forest Lake, PA in May 2000. Typed by Ruth Bryan. BROWNSON Isaac 7/27/1758 8/23/1853 Revolutionary War marker and flag. Local tradition says that Isaac was adjuntant to Gen. George Washington. Note: All of the above inscriptions are on one four sided marker with about an eight foot high spire on it. HICKS Homer William 2/2/1920 7/25/1995 Married June 14, 1941. S2 U.S. Navy WW II. WW II marker and flag. FARMER Thomas 6/24/1835 81y 3m Revolutionary War marker and flag. FARMER Miss Mary 5/30/1833 48y 1m 15d Daughter of Thomas FARMER. "Go home my friends, dry up your tears, I must lie here til Christ appears." ROGERS Nathaniel Dec. 1838 64y War of 1812 marker and flag. ROGERS Roanna 3/1/1847 His Wife "The weary one, her race has run, her master called, her work was done, so joyfully she went her way, to that great realm of endless day." ROGERS Susanna 6/23/1841 68y 7d Widow of James ROGERS. GATES Nancy 4/3/18__ His Wife (Year of death unreadable). 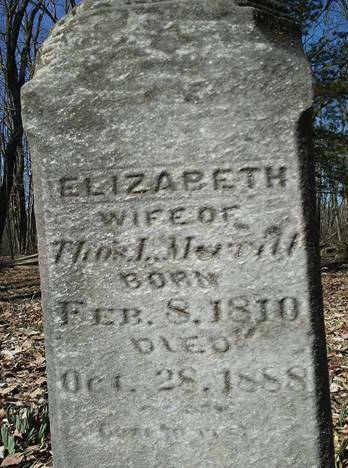 TAYLOR Huldah 2/15/1830 6y Daughter of Israel & Thirza TAYLOR. Subject: Re: Testing to see if this address is still correct. I have attached a WORD file with information about the Babcock Cemetery, Windham Township, Bradford County, PA. There is a correction for the death date for Elizabeth Merrill, wife of Thomas L. Merrill and photos of their gravestone. Also included is an OBITUARY for Clarissa Theis Hicks whose gravestone does not have a death date. The remainder of the document has notes I made on work performed at the cemetery and additional research data I collected about people buried there. Please feel free to edit and use what you want for your website. Thanks for the great work on the Tri-County Website! 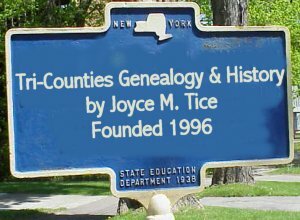 I spent a lot of time in Bradford County, Pennsylvania, looking for my mother's ancestors, CHAFFEE, MERRILL, etc. in the late 1990's. Checking out many cemeteries, I finally found the Babcock Cemetery on Babcock Hill Road, Windham Township, and located my Great-Great Grandparents graves, the Merrill's. I frequently visited the cemetery and helped Mrs. Patricia Kuhlman clear brush, limbs and weed whacked much of the cemetery. Since she passed, my wife, Rose, and I worked in the cemetery several times each year. Thomas L. & wife Elizabeth (Buffington) Merrill are both buried in the Babcock Cemetery on Waite (Waits)-Babcock Road, 1.3 miles North of State Route 1049 in the town of Windham (East side of town by Warren Twp.). The road runs in a North-South direction and changes name partway to NYS. Elizabeth, Wife of Thos. 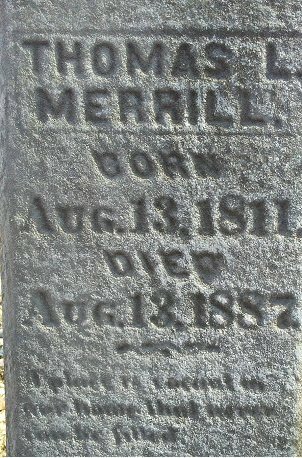 L. Merrill, born Feb.8, 1810, died Oct. 28, 1888. Her epitaph reads: "Gone to rest". second side had: Father - Mother with their hands clasped. Thomas L. Merrill, Born Aug, 13, 1811, died Aug. 13, 1887. In the census, 1850-PA-Bradford Co.-Warren Twp. : Thomas L. Merrill 39 farmer b.NY, Elisabette 40 b.PA, Olive M . 17 b.PA, Eleanor 16 b.PA, Emeline M. 14 b.PA, William E . 11 b.PA, Arthur 8 b.PA, Martha 5 b.PA, Dayton 4 b.PA, Allice 1 b.PA, and Mary/Merry? Merrill 76 b.CT (maybe Thomas's mother?). In the census, 1860-PA-Bradfoord Co.-Warren Twp. : T.L . Merrill 48 Farmer now b.CT with real estate of $2k & personal estate of $1.73K, Elizabeth 50, Arthur 17, Martha 15 , Dayton 13, Ellis 11, and Benjamin 9. In the Bradford Co. Courthouse, in January 1864, Milow Dimon transferred land to Thomas L. Merrill in the town of Warren. It was recorded in Book-84, Page-80. Thomas L. Merrill in February 1868, transferred land to Arthur T. Merrill in the town of Warren. It is recorded in Book-84, Page-82. On the next page, 83, he also transferred land to William B/E. Merrill. These are sons of Thomas L. Merrill. In the census, 1880-PA-Bradford Co.-Windham Twp. : T.L . Merrill 68 farmer born NY, his parents were from CT, and wife Elizabeth 70 born PA, her parents were from PA. Next door is Joseph Babcock 38 farmer, wife Sarah 39, Lulu 13 , Fanny 11, Bertha 6, Benjamin 4, and Bessie 1 (4-daughters and 1-son). Residence: Sarasota, FL, formerly of West Warren, PA.
Visitation: Services: A memorial service will be at 10:30 a.m. March 10 at Beautiful Savior Lutheran Church in Sarasota. Survivors: Sons Bill, Ron, Doug and Larry; eight grandchildren; and four great-grandchildren. Eulogy: Clarissa Theis Hicks made her final journey to be with Jesus on Feb. 12, 2007. She died in peace and she wishes all her friends and neighbors peace and joy as they continue this earthly journey. She is now with her beloved husband, Homer William, who preceeded her to heaven. Chris was a longtime resident of Oakwood Manor Mobile Home Park in Sarasota. She was an active member of Beautiful Saviour Lutheran Church of Sarasota. Chris was an avid crocheter and enjoyed both teaching and practicing the craft. Chris' earthly remains will be cremated and returned to Pennsylvania to be interred next to her husband. Flowers are discouraged but memorial contributions to the Dystonia Foundation or Hospice will be greatly accepted." father: Homer Hicks, mother: Olga Schwartz; SS# 135-18-3626 Issued NJ. In the Florida Death Index: Homer William Hicks 75 died at Sarasota, FL. Homer Hicks 36 3xMO mrd. @27 Chauffer-Helper-Express Co., wife Olga 28 mrd. @19 NY,2xGermany, son Harmon 7 PA, son Homer 9 PA, bro-in-law Theodore Swartz 22 PA Upholstering Automobiles. Entries: 22 July 2011 & 6-07-2015: Found Private Graveyard in 2011; in spring of 2015, we visited graveyard on Babcock Road in Windham Twp., Bradford Co., PA (referred to in past as Babcock Hill Cemetery) near intersection of Kuhlman Road. It had been neglected for some time with parts overgrown and several large limbs of a dead tree had fallen on two Hicks family military grave stones and knocked them over. Many other gravestones were leaning and nearly falling over. I, Don Dillenbeck, returned on Monday Memorial Day, 25-May-2015, and cut up most of the tree limbs, removed brush, limbs, trees, and cleared overgrown bushes around the Merrill graves. When I arrived there, I saw some farmers at the Kuhlman farm and asked where to park my truck and where to put trash removed from the cemetery. The farmers, I found out later, were sons and descendants of the Kuhlmans who lived there presently. Some of the tree limbs on the ground were rain soaked over the years and were too heavy to move. Those, I cut up and placed in nearby piles to dry before removal (which I did later). I was pleased when I returned on Memorial Day, to find that someone had placed new U.S. Flags on the graves of the veterans buried there! On Saturday, 6-June-2015, my wife, Rose & I, returned to the cemetery again to perform more work on the cemetery. In the cemetery are buried 2-Revolutionary War veterans, 1-War of 1812 veteran, and some WW-II veterans; all of their graves neglected. We removed more tree limbs, weeds, brush, and carried previously cut up branches away. Then, we dug around, removed, enlarged holes under 5-fallen and leaning gravestones. One was very large and heavy, and when ready to replace it, I hailed one of the farmers, who returned and helped us turn, lift, and slide it into the deepened hole. Frost over the years had lifted and tilted the gravestones. We put rocks alongside the stones, then filed and packed dirt around them. We photographed many of the stones. Isaac Brownson born July 27 1758/1768 --- died Aug.23, 1853 Revolutionary War. Joanna Beardslee, his wife born Feb,26, 1764 --- died Oct . 24, 1842. Benjamin Babcock born Apr.22, 1782 --- Died Jan.25, 1857. Helen (?Ellen N.) M. Babcock his wife, born June 1, 1817 -- - died Oct.9, 1843. 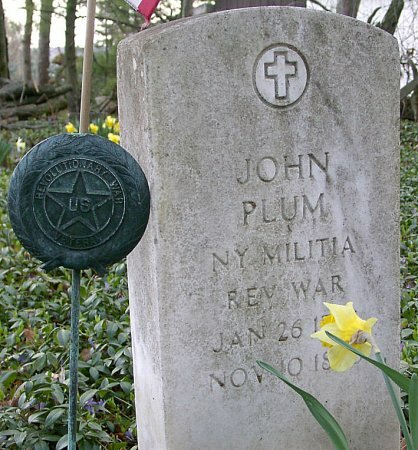 John Plum, NY Militia, REV. WAR., Jan.26, 1765 --- Nov.10 , 1850. 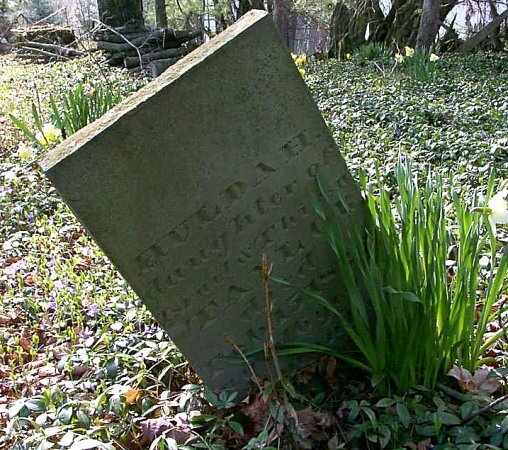 Susanna widow of James Rogers died June 23, 1841 aged 68 years and 7 days. Married Feb.9, 1952. Parents of: E. Daniel Kuhlman (met him in 2015), Mark (Connie) Kuhlman, Elizabeth (John) Whitmore, Faith (Tom) Hundley. Obit in online Babcock Cem., Windham Twp, Bradford C., PA.
And joyfully she went her way, To the bright realms of endless day. Nathaniel Rogers died Dec.8, 1858 (?1838), Aged 62 years (b ~1796), WAR OF 1812 veteran. Thomas Farmer died June 24, 1835 81yr, 3mo Rev.War. Maybe another KUHLMAN stone with husband and wife listed, No Photo? Subj: Plums in Bradford Co. Thank you for all of your efforts in maintaining the Tri-county Website. Because of you, my wife and I were able to visit the gravesite of my ancestor, John Plum, in Babcock Hill Cemetery, Windham Township, Bradford Co., PA the end of last month. The cemetery was beautiful, with daffodils and myrtle in bloom. I have attached two pictures of John's headstone and one of his granddaughter Huldah, who is buried next to him. I hope you are able to open them. They are in Image Expert. John was a Revolutionary War veteran, and a medallion and a flag denotes that. The flag was relatively new, so someone is making sure that they are maintained, and I am grateful for that. BEST Patricia Kuhlman, 70, of Windham, Pa., passed away Wednesday, November 20,2002, at Robert Packer Hospital, Sayre, PA. She was born on November 21, 1931, the daughter of the late Harvey and Jenny (Coleman) Best. She was predeceased by her husband Ernest J. Kuhlman in 1982. Patricia is survived by her two daughters and sons-in-law, Elizabeth and John Whitmore, Windham, Faith and Tom Hundley, Palmer, AK; her two sons and daughter-in-law, Mark and Connie Kuhlman, Windham; E. Daniel Kuhlman, Windham; her seven grandchildren, Daniel Williams, Nicole Crawford, Esther Hundley, John Hundley, Abbie Kuhlman, Erica Kuhlman, and Michala Kuhlman; her sisters and brothers-in-law, Carol and Kenneth Cotton, Tioga Center, NY, Ruth and Wendell Garrison, Nichols, NY, Mary and Karl Rude, Sayre, PA; and also many nieces and nephews. Patricia enjoyed gardening and took great pride in her Japanese Garden. She also enjoyed rug hooking, and was an avid collector of many things. Patricia loved to travel and one of her greatest memories was building and living in a log cabin in Alaska with her family. She was a faithful and devoted member of the Zion Lutheran Church, in Owego, NY. She was also a member of the Daughters of the American Revolution, and the Lutheran Women's Missionary League. Patricia especially loved the Lord, and her family. Funeral services will be held at the Zion Lutheran Church, Rte 17c West, Owego, NY on Saturday, November 23, 2002, at 10:00 a.m., with Rev. David D. Heitner, pastor, officiating. Burial will follow in Babcock Hill Cemetery, Windham, Pa. Friends are invited to call at Richards Funeral Home, Rt. 17c West, Owego, NY, on Friday evening, from 6 to 9 p.m. In lieu of flowers, please direct memorial contributions to the Zion Lutheran Church and School, 3917 Waverly Rd., Owego, NY 13827.